The artist and photographer Kitty Alice Snead explores an ancient culture and its rituals, as they exist today. First, through the classic medium of black and white film photography, and later with digital color stills and video, she documents the faces, environments, celebrations and daily life of an indigenous people. As a native of South Texas, the influence of Mexico’s rich heritage is seen in her passion for photographing the Tarahumara of Chihuahua’s remote Copper Canyon region. 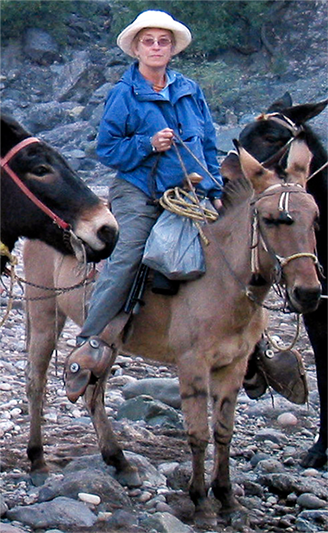 Over a period of 10 years she and Sierras guide, “Santiago James Barnaby, organized expeditions and traveled together by mule and on foot, to observe and study this indigenous group in their rugged habitat. Stepping back in time, she documents and interprets the practice and meaning of their daily life and traditional ceremonial customs. Today, there is urgency in her work as the Tarahumara undergo rapid social change. Ms. Snead’s facination with ritual develoed during her career as an actress. Classically trained by the Academy of Dramatic Art and Baylor University she later became a company member of the Iowa Lab and New York’s Puerto Rican Traveling Theatre. On returning to Texas as a bilingual teacher and counselor for the Dallas Public Schools, she began to use her own travel photography featuring ritual centers of the world to teach cultural awareness and respect. In 1992 in Chaco Canyon she met New Mexican photographer Douglas Kent Hall. As mentor Hall expanded Snead’s ability to create works of art that speak to her love for the people and places that feed her spirit. In addition to Hall she traveled with photographer Joe Englander before teaming with “Santiago” in Mexico. Her art is in the collected by The Wittliff Gallery of Southwestern and Mexican Photography, and by of many private patrons. Snead’s work has been recognized and encouraged by the Southwest Center of the University of Arizona through grants and publication in The Journal of the Southwest. She is a member of the Amon Carter Museum’s Stieglitz Circle, The Artist’s Salon Group of Dallas and The Texas Photographic Society.